The CHBE Graduate Students Club arranged another successful seminar in January as part of its Professional Development Seminar Series. The club hosted Mr. Claudio Arato, P.Eng. on January 13th. Mr. Arato is Director of Engineering at Sonoro Energy, leading the company’s research, development and technology commercialization efforts. He is also a Senior Engineer with S2GBioChem, a UBC-based cleantech startup company. Mr. Arato was elected as an Engineers Canada Fellow in 2011 and received a Community Leadership Award from UBC’s Faculty of Applied Science in 2013. He has also been a member of CHBE’s Industrial Advisory Committee for over ten years. In his presentation, Claudio discussed the roles and responsibilities of the positions he has held in various companies throughout his career. He touched not only on his successes but also on his failures, and described how the lessons he learned from his failures have led to some extraordinary successes in other endeavours. 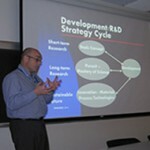 He advised graduate students to explore the potential benefits of their research works for society. When taking a technology or product out of a research facility to the market, non-technical factors such as government plans, financial arrangements, social systems and the cultural environment are as important as the scientific and technical knowledge. Students should look ahead at the value of their present day research in the context of market demand in 10 or 20 years’ time. Graduate students from other engineering departments joined CHBE faculty, post-doctoral fellows, visiting scholars and graduate students for this insightful seminar by Mr. Arato.